I’m a base camping convert. I used to love taking backpacking trails that would loop all over the backcountry, allowing me to set up my tent in multiple areas. I thought this meant more views, more wildlife. And maybe it does. But lately, I’ve been savoring the perks of a base camp. I get the fun of sleeping out in the backcountry, without having to hike with a heavy pack everyday. The less time we need for setting up & breaking down camp means more time for savoring sunrise coffee (insert pic), day hikes & other pursuits. The creativity seems to turn on at base camp. Reading/Storytelling: Books loaded to iPhones are that much better when read aloud (taking turns). We’ve had childhood favorites like A Wrinkle in Time & outdoorsy reads like A Walk in the Woods. Tip: Choose your stories & timing wisely. We ended up reading Bill Bryson’s take on bear attacks one night before bed. It was hilarious at the time of reading but left me a bit freaked out after lights-out and all of the mountain noises grew louder. Yahtzee! : Small die games like Yahtzee don’t add a lot of weight and make it easy to pass the time. Plus its still super fun to yell YAHT-ZEE! Dance Party: If your phone has power, then you’ve likely got tunes. One rainy day, we got our spirits up with Beck & Marvin Gaye. There wasn’t anyone around to see our awesome moves, but I think the deer were impressed. 4. Painting: A recent NOLS instructor introduced me to the most amazing watercolor kit. 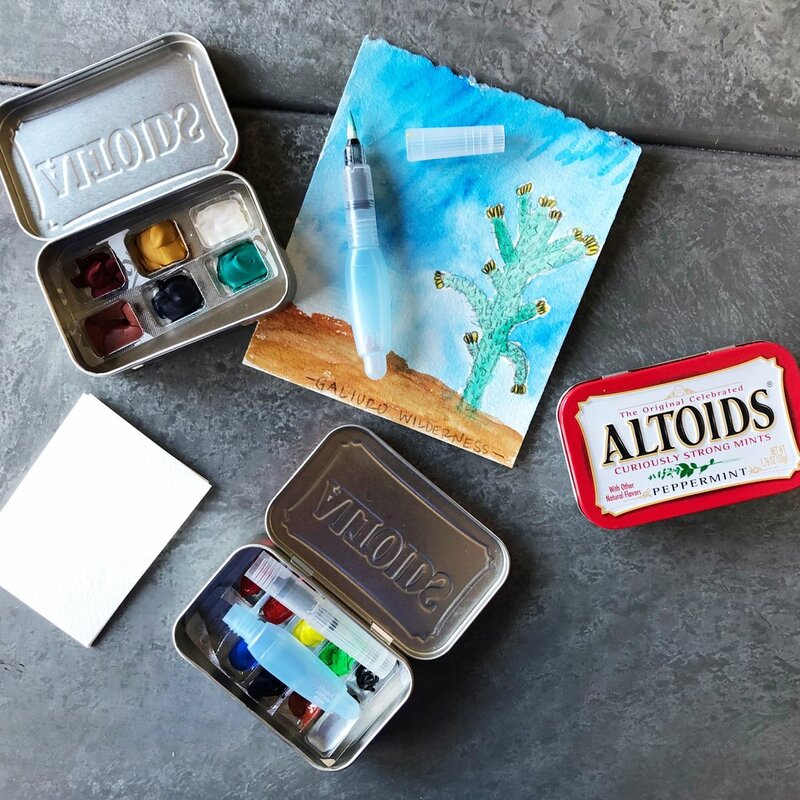 Take an Altoids tin, add some gum containers, paints & a brush and you’ve got all you need to create your masterpiece. See Pinterest for details. Not only can you paint at base camp, but you can pack these tiny guys for day trips & capture your scenery over an extended lunch break. Love. 5. The Frenchman. This one takes some explanation, but stick with me…its worth it. The Frenchman is a photographic interview book. The interviewer asked his subject (French actor, Fernandel) questions about America to which he would respond using only facial expressions. The book is amazing. To play this game, we took turns saying the names of animals we saw & the other person had to react to seeing that animal. As a bonus, take pictures during the process. Here are our faces. 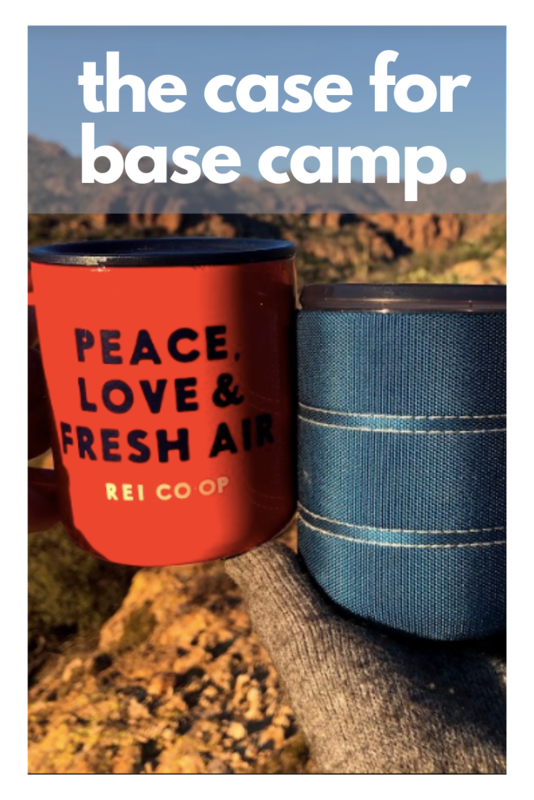 We can’t be the only kooky people out there making these things up, so please share your base camp activities. We’d love to take them out on trail soon!